The Premium Edition contains a complete listing of all Canadian postal codes, associated geographic coordinates, time zone with daylight savings time indicator, and primary area code. Abbreviation VARCHAR(13) Standard Canada Post 13 character city name abbreviation. 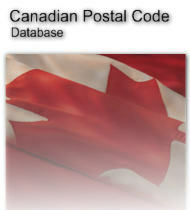 UTC VARCHAR (28) Time zone the Postal Code is located in specified as a Universal Time Coordinate offset.